I have the amazing gift of precognition, only when I become aware of a future event, instead of preparing for it, I do exactly the opposite. Example? The future event is that I'm at the Victory bus terminal in Cubao, seated quite uncomfortably, forehead beaded with sweat from the intense heat coming from the overhead light. I'm headed for Baguio and I didn't expect there to be many people waiting for the bus because it was much less crowded when I went to the highland urban city just last month. And that was for Panagbenga, the city's flower festival which draws tourists in the thousands yearly. My bus isn't due to arrive until around 11:30 so that means over an hour of waiting. The thing I did in non-preparation for this? Remove Stieg Larsson's The Girl with the Dragon Tattoo and John Green's The Fault in Our Stars from my luggage to make room for other things. 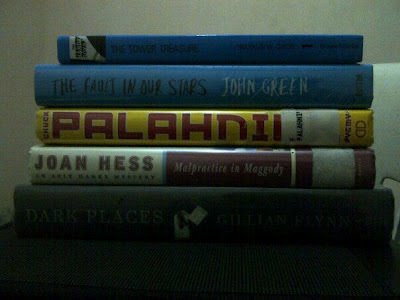 Hardcovers I managed to salvage from National Bookstore's sale bin (save for the first two, though I was still able to buy them at a discounted price). What's on the terminal TV is a Korean drama which is difficult to follow on mute and without subtitles. I have no one to chat with since I'm traveling alone, as I've done those two times I went to Baguio earlier this year. I've got nothing left to do to kill time, so although this is going against the idea of conserving my BlackBerry's battery so I can listen to music later during the trip, I'm blogging. There's no one to mind my spot while I get a drink. Like right now. I'm parched but I can't leave my things in my seat to reserve it (the dude beside me doesn't seem nice enough to entrust with them) and I certainly don't want to carry all 60 pounds of my luggage around just to abate my thirst. There's no one to laugh at myself with in case of an embarrassing situation in public, such as tripping over my luggage or setting off an alarm. Hasn't happened to me, really, which is good. Hopefully the opportunity doesn't present itself ever, whether I'm alone or not. No one to ask for food because I forgot to bring some for myself...or because I did bring some but, like a greedy grade-schooler on a field trip, don't want to share. But I am coming up with a blank. Any other day and I think I'll be able to mention more than just not having anyone else's luggage or fare or seat or general well-being to mind, but tonight, surrounded by these groups of friends, lovers, and parents with their kids, all of them happy and obviously giddy with excitement at the prospect of adventures in Baguio, I kind of wish I had someone's general well-being to worry about. I really should have brought either Stieg Larsson or John Green with me instead of my friend Julia's DSLR. Now to hell with conserving phone battery! Where the heck are my earphones!